There were seven daily newspapers in Toronto. Each had their own army of newsboys. If you knew how to hustle and had a good location, there was money to be made. Unfortunately, if you knew how to hurt and intimidate newspaper boys, there was even more money to be made. The Kellys did the latter. If any kid tried to sell newspapers on the East Side of the city, the Kelly Gang surrounded him and demanded half his money. If he refused, they beat him up and took all his money. Although I was small for a fifteen-year-old, I figured I could beat almost any Kelly in a one-on-one fight except their leader Sean, alias Himself , who was huge for sixteen. But the Kellys never fought one-on-one. And as Sean always bragged with a smile, You fight one Kelly, you're fighting all the Kellys. 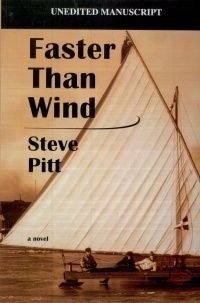 Steve Pitt's Faster than Wind is a historical novel and coming of age story about a year in the life of a 15-year-old boy named Bertie McCross. On Christmas Eve, 1906, Bertie is selling newspapers on a lucrative street corner to help his parents make ends meet, but he refuses to share his earnings with the Kelly Gang. Following an exciting chase sequence, Bertie McCross is rescued from Toronto's mean streets and the Kelly Gang by Tommy and Ed, two young men who invite Bertie to join their ice-boat racing crew. As Bertie learns how to navigate an ice-boat on a Lake Ontario's dangerous and unpredictable frozen surface, he is introduced to the adventurous and wealthy beauty Isobel and Hwei, a shy, hard-working newcomer from China who works at his uncle's laundry. Together, this unlikely group that represents a cross section of Toronto's population resolve conflicts to work towards winning the Durnan Cup. In an interesting twist of fate, Bertie risks his own life to rescue Sean and his gang from drowning in the Lake Ontario. By Christmas Eve, 1907, Bertie learns important lessons about class, identity and friendship. Although this cast of characters is contrived and didactic, Pitt's vivid descriptions of the ice-boat races and Bertie's struggle to escape the Kelly Gang's wrath reward the reader with exciting action. In addition, Pitt also includes interesting details about the history of the automobile, the origins of CCM, (a manufacturer of bicycles) and a glimpse of Toronto's culture at the beginning of the 20th century. Pitt, whose first book, Rain Tonight, was nominated for the Silver Birch, Red Cedar and Rocky Mountain awards, has produced in Faster than Wind a fast-paced, thrilling story recommended for any library, but especially school libraries. The book will appeal to young adults who are interested in sports and history – two topics that don't often intersect. Philip Bravo is a Librarian at the Winnipeg Public Library in Winnipeg, MB.